Why choose a steel frame and chassis hut? We make the hut with a steel frame and chassis as Dave has over 30 years’ experience in steel frame buildings. We use 40mm box steel for the frame and 50mm box steel for the chassis. This gives you a long lasting hut that can be moved almost anywhere and not twist or swell like wooden frames; also, you don’t see the frame at all and only a small part of the chassis so it’s not important for the look of the hut. It does not create a cold bridge and cause condensation as some think. Do you give a guarantee with the hut? We give a 30 year guarantee for the frame, chassis and wheels. If you have a corrugated exterior, we get a 30 year guarantee from our supplier unless you are within 25 miles of the coast line; this is then reduced by 10 years and you have a choice of over 25 colours – which isn’t painted on, it comes as the colour chosen and is .07 plastic coated so will never peel off. The Red Cedar Wood is supposed to last as long as the corrugated, we have been told, but it does need treating at least three times a year to help preserve the wood and colour. The only thing you have to do is look after the windows and doors and clean the corrugated with water when needed. Do you import any products for making the huts? No! We use all local suppliers wherever possible. If it cannot be sourced locally to us, then we always use a British manufacturer. Even our cast iron wheels are made by a local family-run traditional foundry that keeps our pattern for our exclusive use. Our windows and doors are made by a local joinery that we could practically walk to and collect them; they use the same practice as us, to buy everything locally, even the ironmongery. No imports for us!! Even our number plaques are made locally to us, which we order in batches of 10. When you order a hut, we give you the next number. This is then put on the hut before it’s delivered in a place of your choice. We think it will then be part of history when people look back in 100 years’ time and will be able to see how many we made and where in the UK or aboard they went. Do you insulate the huts? Yes! We use insulation on the roof, walls and floor. We can also supply certain products for insulation; if you want a recycled product or have your own choice of insulation, ie. wool, we can do it. You can use your hut all year round; all you need to do is to make sure you have a small heater during the winter just like you would in the house. Are the huts too warm in the summer if it’s all corrugated? No! They are so well insulated that they keep cool in the summer and warm in the winter. We even tried this out last year at the CLA game fair as it was one of the hottest weekends of the year. People came into the huts to cool down and asked why they were cool, which is down to the amount of insulation, especially in the roof; we asked people to touch the roof panel on the outside and then the interior roof to see if it was true. So it would be the like saying ‘like a cat on a hot tin roof’, but not on the inside! What safety standards do you use? 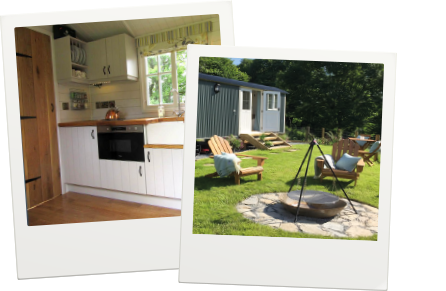 We have a team of qualified electricians who we use to NIC level to install our electrics so we can supply you with a certificate if you are renting the hut out. Also, we have a team of qualified plumbers to install the boilers and a caravan expert who is qualified in the ALDE system if this is installed in any of the huts. There have been recent changes in the law for installing wood burners in huts, so we now price for delivery & installation of a wood burner as a separate item to the hut. We have a company that are qualified HETAS engineers and will travel to where ever in the UK or abroad we take the hut, once we deliver the hut they will then install the wood burner and give you the safety certificates. So we all know everyone is safe then! As standard, we include a carbon monoxide alarm, fire extinguisher and smoke alarm in all of our huts, also a fire blanket if you have a kitchen in the hut. Do you charge for delivery? What if we need a crane and what if we have access issues? Delivery is free within 100 miles of our postcode (B96 6TG). After that, we just ask for our fuel money and, if there are any overnight costs, we ask for money towards the cost of the accommodation. We do not charge by the hour when we deliver the hut. We stay with you until you are happy with the position of the hut and we have explained all the details to you. Even if it all takes all day, we stay with you! Our huts are always delivered by our own people. We do not get a haulage company involved, even when we deliver to the south of France it’s our team! We have our own specially-made trailers that have been built exactly for our huts to travel on, which makes them easier to remove from the trailer and position. We find out when you order your hut if you have any delivery issues and we will always, if possible, do a site visit if you are unsure. Dave has dealt with crane companies with his steel construction company and is used to being the slinger signal either by hand movement or radio control. We find a crane company local to you (to cut down on costs). They are always willing to do a site visit and establish the level of difficulty. If they can do it, then we can as well. We do not make any money on this – you pay the company directly. Do we need any special base for the hut to sit on? You can sit the hut on normal slabs. We can let you know the distance between the wheels so you can get this ready before the hut arrives; some customers have placed a concrete slab sunk into the ground or even railway sleepers. Depending on the condition of the ground, you can always just leave it directly on the ground. Can you move the hut once we have installed it? We supply a detachable draw bar with a turn table underneath so that you can move your hut in a complete circle and re-position the hut. All you need is a vehicle with a ball hitch. A quad bike, tractor or Land Rover is fine. This is really useful because, in the winter, you may prefer the hut to be nearer to somewhere and then have it moved to a different location for the summer. If you move house, we can always come back with our trailer and help you move it so you never lose on your investment because it goes with you. Again, this is a good reason to have a steel frame and chassis as it will cope with most journeys off the trailer on private land and not twist or move like timber frames. What do you use on the interior finish? We use tongue and groove for the walls, then the rest is really your choice. We can supply anything for an interior you can think of, designed completely by you. Most people have a good idea of what they want in their hut by the time they order it, but we can always give you ideas. Even the interior colour is your choice with sockets and switches, down to what choice of floor; either a well-made laminate flooring, which we have used on our show huts so we know it can stand up to the foot fall and all weather conditions, down to re-claimed oak floor boards. It really is up to you. Even the panels are horizontal and vertical with a dado rail. This is really your choice as well we will do whatever you prefer. How rodent proof are the huts? We have an aluminium facia below the curve of the roof, which will stop any birds or rodents getting in the gaps and a small gap at the bottom of the corrugated side panel with a drip flashing that allows the air to circulate but is too small for anything to get in. What is the history of a traditional shepherd hut? We are in close contact with a historian called Ian McDonald, who has his own website with the history of huts. He can tell you almost anything you may need or want to know about the history. We contacted him a lot during our early days to find out different things about the huts and if we were doing things correctly. He can even tell you why wheels are sometimes under a hut and not sat on the outside of the huts, which is really down to who and where they were. The huts were made in the country. He even let us have pictures of original huts that were most like our style. We have also had the privilege of at least three of our huts being used in a book about the history of huts and living vans by David Morris. This is available in paperback, called Shepherds’ Huts and Living Vans by David Morris. We have found that some people do and others don’t. The planning department local to where you live will let you know if you do or do not need planning. If you are going for change of use on the land or renting the hut out, then you do tend to need planning. Otherwise, we always advise you to contact your local planning officer and ask their advice. We have an architect who will do a scale drawing with elevations and floor plan that you can use if you need to go to planning. This has been really helpful to some of our previous customers who did need planning as the planning officers have it all correctly shown in their particular style required. This usually incurs a cost from the architect but it is not expensive. It is then always nice to keep showing people how it all started. Can we stay in one of your huts before we buy one? We have customers who have purchased huts from us and rent them out as a business or diversified from their normal line of work. Please contact us of you would like to know where they are based and we can give you a link to their website. Depending on whereabouts in the UK you are, we can normally find someone near to you. Some even have hot tubs as part of the rental! It’s also a great idea to stay in one as then you get a much better feel for how you would like your layout and if you really need certain things in your hut. We have not made one hut the same yet and there have been quite a few now.